Blvd @ Changi: Cafe by Day, and Bar at Night with Hand-Stretched Pizzas, Matcha Waffle & $2 Coffee! If you’re working around Changi City Point, or looking for a quiet place to chill during the weekends, you better pay EXTRA attention to this article! 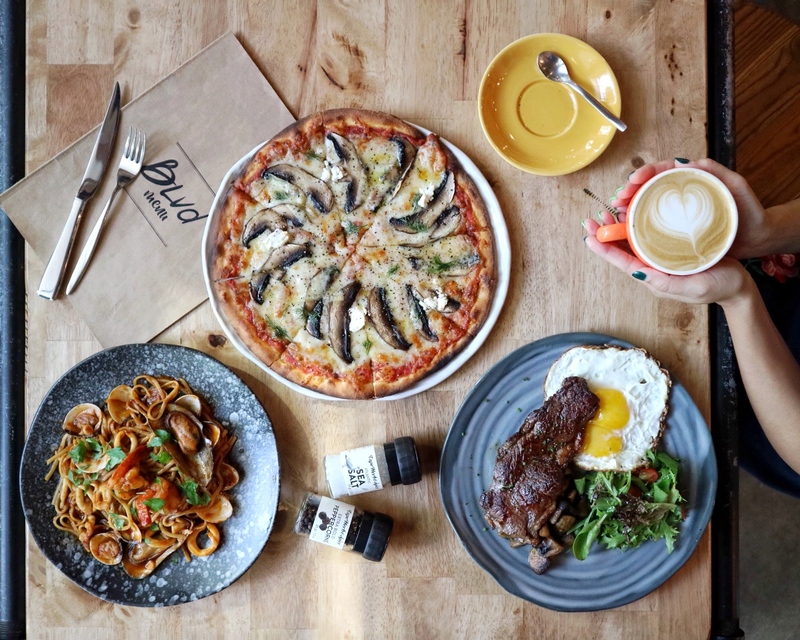 Located at a hidden corner within Changi City Point, Blvd @ Changi is a cosy and laid-back cafe by day, and a hipster bar by night that offers an extensive range of mouth-watering Western dishes without you having to break the bank. Think hearty dishes such as burgers, sandwiches, hand-stretched pizzas, paninis, steaks, waffles and many more! On top of that, you can also enjoy Blvd’s gourmet coffee at only $2!!! Isn’t that insane? For the avid cafe-hoppers, you can have a relaxing meal at the cafe (away from the hustle and bustle) without having much disturbance. You can take as many photos as you want without getting judged because the cafe is usually quiet during the weekends! For the drinking buddies, you can definitely unwind your stress away with a drink or two at Blvd! So, what are you waiting for? Share this hidden gem with your family and friends! Psst! The space at Blvd @ Changi is great for all sorts of events too! The food at Blvd is really huge and that means you need to bring more people to share the food. Food tastes extremely delicious when it’s shared! Like what I’ve mentioned earlier, you can have a quick coffee meeting here, or a intimate meal with your loved ones during the weekend. Some of you might say it’s not a good idea to go back to a office area during the weekends, but why not? If the food, ambience and service are good, I really wouldn’t mind! And because I don’t really sit well in crowded places, Blvd @ Changi is the perfect place for me! Pizza was well-baked, flavoursome and not too oily! Crust was not too bad but personally, I preferred a thinner crust. They were really generous with the ingredients placed on the pizza. Definitely goes well with coffee or even an iced cold beer! Good for sharing! The pasta was definitely rich in flavour, especially the lobster aroma which I don’t think anyone can resist! Sadly, the pasta was a tad too wet for me (in my opinion) – would have loved it even more if the sauce is not that much. But I have to say they are really generous with the seafood served! Oh my! The steak tastes better and better with each bite. It was tender, flavoursome and very juicy. Even though we left it on the table for quite a while, the steak wasn’t tough at all. A MUST-ORDER! My friend really liked this as well! Ending the feast with my FAV Matcha Waffles & Matcha Ice Cream! Loving this rendition from Blvd because the waffle and ice cream have a subtle bitter aftertaste! The sweetness of the Azuki beans then balances off the bitterness! So good that I finished almost everything myself! Definitely worth the calories gained! Previous PostPaddy Hills: Returns with Brand New Brunch Menu! Next Post(NEW) Go-Ang Pratunam Chicken Rice Singapore: Thailand’s Michelin Award-Winning & Popular Chicken Rice NOW in SINGAPORE, at NEX!